New: Lyme Disease Vaccination/Horse: - Many equine vets are now offering Lyme Disease Vaccination for horses in areas where Lyme Disease is known to be endemic. This vaccination is actually made for dogs. The efficacy and safety are not yet known in horses because the FDA has not yet given approval for horses. However, there is evidence that it is probably safe and effective. 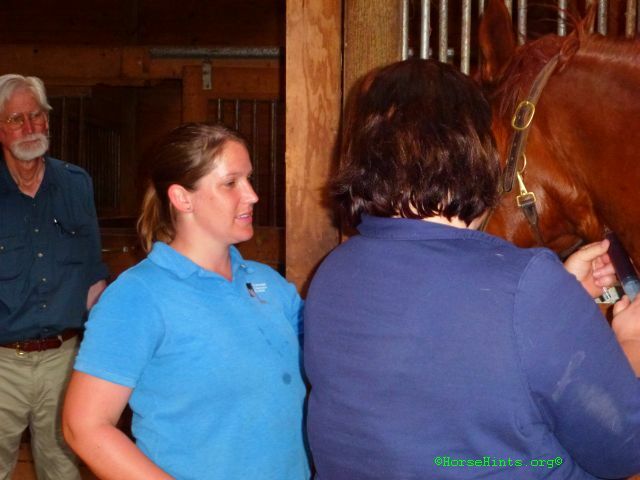 Your vet and you must determine if this is a vaccine that should be given to your horse. It is NOT recommended for horses who have or have had Lyme Disease. Did you know that you and your horse can get Lyme Disease? It is a really nasty disease and presents with an array of signs and symptoms. It is difficult to diagnose and mimics other horse diseases. Lyme Disease was discovered approximately 30 years ago in Lyme, Connecticut. The bacteria Borrelia burgdorferi, Genus Ixodes, is the culprit that causes Lyme Disease. It may be referred to as Lyme borreliosis. Actually, children were the first to be diagnosed as having Lyme Disease. The organism B. burgdorferi is not a bacterial infection. The transmission of this bacteria is via a tick bite. Do All Ticks Transmit Lyme Disease? Duration of tick attachment as a predictor of the risk of Lyme disease in an area in which Lyme disease is endemic. AU Sood SK; Salzman MB; Johnson BJ; Happ CM; Feig K; Carmody L; Rubin LG; Hilton E; Piesman J SO J Infect Dis 1997 Apr;175(4):996-9. Animal studies have shown an exponential increase in the risk of Borrelia burgdorferi infection after 48-72 h of deer tick attachment. Persons with tick bites were prospectively studied to determine if those with prolonged tick attachment constitute a high-risk group for infection. Ticks were identified, measured for engorgement, and assayed by polymerase chain reaction (PCR) for B. burgdorferi DNA. Duration of attachment was determined from the scutal index of engorgement. Of 316 submissions, 229 were deer ticks; 14% were positive by PCR. Paired sera and an intact tick for determination of duration of attachment were available for 105 subjects (109 bites). There were 4 human cases (3.7% of bites) of B. burgdorferi infection. The incidence was significantly higher for duration of attachment > or =72 h than for <72 h: 3 (20%) of 15 vs. 1 (1.1%) of 94 (p = .008; odds ratio, 23.3; 95% confidence interval, 2.2-242). pcr was an unreliable predictor of infection. tick identification and measurement of engorgement can be used to identify a small, high-risk subset of persons who may benefit from antibiotic prophylaxis. To understand how humans and other mammals acquire this infection, you must understand how ticks acquire the bacteria first. 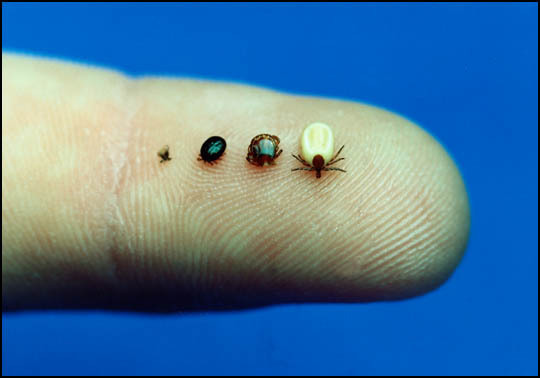 The Ixodes species of tick (also known as a deer tick or black-legged tick) has a two-year life cycle from egg to adult, requiring a blood meal at each life stage. The larval form of the tick begins as it emerges from the egg, which is usually laid in decaying leaves by its mother, often in the spring. The larvae then feed on small mammals such as mice or birds to have a blood meal. Once fed, the larvae can molt into nymphs, but remain dormant until the following spring. The next spring, the nymphs are hungry and will feed on mice or other mammals, such as humans, dogs, or horses. Then the ticks molt again and develop into adults. The adults will again feed on humans, horses, or other large mammals, but especially deer. Then they mate and lay eggs. The adult female ticks will die after laying eggs. The ticks become infected with B. burgdorferi after the first or second blood meal as larvae or nymphs. In the Northeastern United States, the ticks most often acquire the Borrelia organism from white-footed mice. The tick is considered a reservoir for the Borrelia organism, as it lives within the tick while causing no apparent disease. From right to left: An engorged adult deer tick, an adult before attaching to the skin, an engorged nymph (young tick), a nymph before it has attached. Both adults and nymphs can transmit Lyme disease. The Borrelia organism has also been cultured from mouse urine, but at this point, we do not think that transmission to horses, humans, or other creatures occurs in any way except via a tick bite. There has been no evidence that transmission of Lyme disease can occur directly from animal to human; there must be a tick involved for transmission. This link has an excellent visual example, with text explanations about the transmission of Lyme Disease. It provides a chart that shows the transmission time over a 3 day period, what the chances are of lyme disease transmission, and shows the changes in the size of the nymph from the beginning of its blood meal to its engorgement. A tick can be attached and sucking blood for days before you find it. You may never find it. A tick will usually leave an itch raised lump where it has attached. It is believed that the tick must be attached for at least 24 hours in order to transmit the Lyme disease organism. Because of that fact, in people at least, the nymph stage of a tick's life cycle is the most likely stage to be infected and transmit the organism responsible for causing Lyme disease. The adult ticks are much larger and are more likely to be seen and removed while feeding on you, your horse, your dog or your cat. The nymph stage however, is quite small (only two to three millimeters long) and much more likely to be missed on you, or especially your hair-covered horse's, body. That means they are more likely to be able to feed for days undisturbed and transmit any disease they might be carrying. The correct way to remove a tick is to grasp the tick with a fine tweezers as close to the skin surface as possible and then pull straight up with a slow, steady force. Place the tick in a sealed container. The Tick Research Laboratory in Rhode Island is one facility that can identify the infectious bacteria that causes Lyme disease, along with certain health departments and other laboratories. Use an antiseptic such as alcohol or antibiotic ointment at the site of the tick bite. Do NOT use your thumb and finger to pull the tick off. When you squeeze the tick you force material from the tick into your horse. It is very much like pulling out a bee stinger. If you squeeze the stinger with your thumb and finger you force more venom from the stinger into the site of the sting. How Is Lyme Disease Detected In Humans? Doctors can diagnose the disease through physical findings such as a "bull's-eye" rash along with a history of symptoms. But not everyone has the rash, and not everyone can recall being bitten. Blood tests (ELISA and Western blot) can be taken 3-4 weeks after suspected contact. Other tests, such as a spinal tap or skin biopsy, may be used to confirm a diagnosis or rule out other conditions. What Are the Signs of Lyme Disease? In humans there might be a bull's eye with a rash around it. The rash rings the bull's eye and spreads out in sort of a circular way. 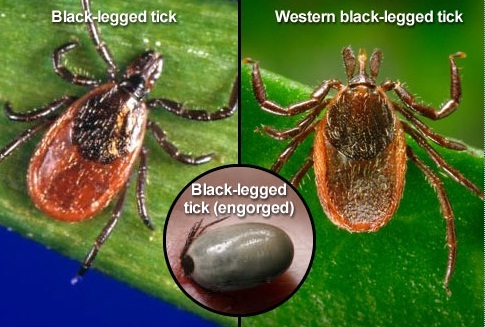 Within 1-4 weeks of being bitten by an infected tick, most people will experience some symptoms of Lyme disease. 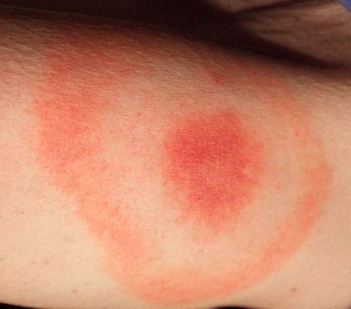 A circular, expanding rash (called erythema migrans) at the site of the bite develops in about 70%-80% of cases. (See image above) Some people report flu-like symptoms at this stage, including fever, chills, headaches, fatigue, swollen lymph nodes, joint pain, stiff joints, inability to concentrate, neurological problems and muscle aches. If the disease is not detected and treated in its early stages, it can extend to more areas of the body, affecting the joints, heart, and nervous system (about 1-4 months after the initial bite). Additional rashes may occur, and there may be intermittent periods of pain and weakness in the arms or legs. Facial-muscle paralysis (Bell's palsy), headaches, and poor memory are other symptoms at this stage, along with a rapid heartbeat and some loss of control of facial muscles. In horses you will not see any rashes. Your horse may have stiffness in his joints, be reluctant to move, shift from leg to leg, be lame, present with a fever, have swelling in the joints, be listless, or have neurological problems. Sometimes horses do not want to be touched or brushed because they can be very sensitive on their skin. As many as 75% of horses living in areas of the country where Lyme borreliosis infection of ticks is high will test positive for antibodies to the organism. How many of these horses have an infection that will cause obvious signs of Lyme disease is unknown. It was once questioned if horses get Lyme Disease. That is no longer an issue. The latest research indicates that horses do get Lyme Disease. To diagnose Lyme disease, the first step is a blood test. The horse's blood will be checked for antibodies to the causative organism. If the horse has a high ELISA titer (greater than 300 Kela units) and a positive Western blot test for the organism, then your horse has absolutely been exposed to the organism, but might not have active disease. If your horse has a high titer and has clinical signs of the disease, then he probably has Lyme disease. If your horse titers is low, the horse may not actually have Lyme Disease. Here are some of the possible explanations for a low titer. In some cases, the disease can absolutely be confirmed by the use of a test called PCR (polymerase chain reaction test). Unfortunately, it cannot be used on blood samples. PCR can detect the DNA of the B. burgdorferi organism, which can hide within the synovial tissue inside a horse's joint, causing pain and inflammation. A sample of this synovial tissue tested using PCR might provide proof that the organism is there and causing disease. Therefore, there could be a confirmed diagnosis of Lyme disease. The disadvantage to this procedure (called a synovial biopsy) is that it is invasive, and many veterinarians will not want to perform this procedure on the farm. The procedure can be performed in a standing, sedated horse, but the environment must be clean and dry. A synovial biopsy is often performed in the fetlock or carpal (knee) joint, but any joint that is suspicious for infection is appropriate. SNAP Testing - This is a quick test that reads positive or negative although it has a higher rate of inaccuracy than other more expensive tests. It is also limited in scope for informational purposes. It can be done in your vet's office. Multiplex testing is more reliable and gives a larger range of information but is more expensive and takes a longer period of time for results. MULTIPLEX Testing/Cornell University - This new test (2011) distinguishes vaccination from disease as well as acute and chronic infections. It also assigns a numerical result that will allow monitoring over time. "...Wagner presented the results of the equine Lyme multiplex assay, a new antibody test available at Cornell's diagnostic lab. This test can detect antibodies as early as two to four weeks following infection, and it can distinguish early infection stages from late. Previously, many equine practitioners have used the Snap 4Dx test (Idexx Labs), one of the only commercially available tests for this purpose until recently. At Cornell, researchers compared Lyme multiplex assay results and Snap 4Dx testing. Overall, both tests detected antibodies against B. burgdorferi. However, Snap 4Dx testing yielded some false positive and false negative results. Wagner recommended confirming positive results on a Snap 4Dx test by also running the equine Lyme multiplex test. 'A negative Snap 4Dx test with clinical signs suggestive of Lyme disease should also be confirmed with the Multiplex test,' she said. Treatment of Lyme disease can also be a problem because it can be prolonged. Many horses come to the Lyme diagnosis after many other treatments have been attempted. Treatment of Lyme disease most commonly involves one or two antibiotics. Tetracyline is a very effective treatment for Lyme disease and is relatively inexpensive. However, it must be given intravenously once a day, so most horses will only be treated with this antibiotic for a short time. Doxycycline is a related antibiotic, but it can be given orally. This drug must be given twice a day, but because it is poorly absorbed from the gastrointestinal tract, treatment duration is often prolonged, frequently one month or more. Sometimes, it is necessary to treat for months at a time until the antibody level has dropped to a low level. In some cases, the organism is never eradicated from the body. If Lyme Disease is caught early many horses respond quickly to the treatment, and the first signs of improvement can be seen in 2 to 5 days. The prognosis is often good. Anti-inflammatory drugs can be used for the pain and stiffness, and stomach medicine may be given to help the horse cope with the antibiotic treatment. Intravenous Injections can be done several ways. (l) The vet can insert a "shunt" that is left in for the five to seven days of treatment. Each day the IV drip is attached to the already in place shunt. A bag is filled with the IV fluid which is a small amount of tetracycline in a sterile water solution. The contents of the bag are slowly squeezed so that the contents go into the horse. Several other horses at our barn are being treated this way by another attending vet practice. (2) Our vet did not use this method on Rusty as he was cooperative. She injected the mixture from a large syringe through a needle that was inserted and mainlined in his neck. She was careful to inject the fluid slowly and vigilant that the needle was in the vein not in the tissue. This antibiotic can cause major tissue damage if injected improperly. This injected treatment form will go on for 5 consecutive days. Some vets go seven days. Next treatment with doxycycline for 30+ days, 2 times a day will be given. Rusty will be given probiotics to replenish the good bacteria in his gut. We had the doxycycline compounded so that it could be given in paste form--just as you would give a paste wormer. The pills are bitter and many horses will refuse to eat the pills or powder even when disguised in applesauce, molasses, etc. Easier to have it compounded. We had this done at Veterinary Pharmacies of America, Inc. in Houston, Texas. It compounded the day it was called in and shipped to us overnight. We paid for the meds by credit card while talking on the phone to the pharmacist doing the compounding. Wedgewood Pharmacy will also compound the doxycycline in paste form. Our vet was kind enough to call in the prescription. This certainly made it easier for the owner of the barn where our horses are boarded. She did not want to crush up tables, etc. for so many horses. Several other horses are in their stalls getting the same treatment. Rough for the barn owner! I would also like to mention that Rusty was asymptomatic--that is, he showed no signs of Lyme Disease before our testing for it. I usually subscribe to the saying "If it ain't broke don't fix it!" With Lyme Disease it has been scientifically proven that early intervention is important for a good outcome. This is why we are doing this treatment. I also want to mention that on the third paste treatment Rusty had a mild colic. Mary Ann treated him with a 5 cc injection of banamione. Within 20 minutes Rusty was feeling better and began to eat again. He perked up and his pawing stopped, as well. Mary Ann decided to only give the paste after the horses had eaten. So far Rusty has not had a problem again. Rusty getting Lyme Disease treatment with IV (tetracycline and sterile water solution) Our vet, Dr. French, and vet tech attending. My husband, Bill, watches and reassures Rusty that it is OK. Haymarket Veterinary Service is an equine ambulatory practice in Northern Virginia. Dr. French is so warm and kind. We feel fortunate to have her as our vet! Note: Treatment is going well. Rusty did colic after 3 doses of the doxy paste. He was given some banamine--he perked up and was fine. All subsequent doses have been given on a full stomach, the probiotics two hours later, then the same thing for the evening dosing. He has been fine since. There are now 8 remaining days of dosing which will take us to 32 days of paste after the 5 IV's. It is a long treatment but will hopefully do its job on the Lyme Disease. After finishing the antibiotic treatment we are going to give Rusty his first Lyme Disease vaccine. Then 3 weeks later his booster. We will continue each Spring and Fall with that vaccine as that is the prevailing wisdom. Time will tell. Since our area is considered the 3rd most prevalent area for Lyme Disease in the United States--Bill and I along with Dr. French and Mary Ann (barn owner), have decided that this would be a good course of action to take. A Patchy tested negative for Lyme so we started him on his shots already. Today, May 8, 2012, he got his booster. We premedicated him with 2 grams of bute paste as A Patchy has had reactions to shots in the past. The second shot was also given in the pectoral muscles in case there is a reaction it does the least damage there. It is an area that is easily drained if need be. All of these decisions are a trade off of one kind or another. A Patchy was given the shot right in the center of the pectoral muscles where there is a vertical line. That way we can monitor the area more easily for swelling, heat or any other reaction. Giving a shot in the pectoral muscles does put the handler at some risk. The individual giving the injection must lean over in front of the horse to see the site clearly and give the injection properly. This position allows the horse to bite, strike out with a front foot or even run over the shot giver. Also, the pectoral muscles tend to become sore easily. 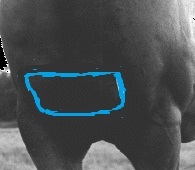 This injection site is where you see the bunchy muscles above in outlined in blue in the lower half of the chest between the tops of the forelegs. Humans can wear long-sleeve shirts and pants to try to prevent ticks from gaining access to their skin. After being out in the elements check yourself all over for ticks including your hair and between your toes. Take a bath. Ticks like warm places so check your armpits and other sensitive areas! A deet insect repellant, that includes ticks on the label, can also be applied to your clothes and skin. Horses are another problem. It is basically impossible to keep ticks from crawling onto our horses and attaching. Several topical sprays used on dogs have been used on horses with mixed results, and the sprays are not approved for use on horses. There is also a canine vaccine against Lyme disease which is now being used for the horses, although not FDA approved at this time. Our vets are using the canine vaccine. Research shows that it is effective but must be kept up. We board our horses and are not on the property. Therefore, we cannot check them every morning and evening to remove ticks. However, we do try to see the horses 3 or 4 times a week. We give it our best shot. The field where they are kept does not have high grass. There are trees, etc. They do get ticks and we remove them ASAP. My horse, A Patchy, was tested for Lyme Disease and results showed negative. We have started him on the vaccination schedule that Cornell University has developed. A Patchy was given his first shot 4/16/12 and has had no visual adverse reaction. He will receive his second shot, a booster, in three months. Then the protocol is to give the shot both spring and summer. Hopefully, this protocol work keep him safe from that disease. The shot is not recommended for horses that test positive with a numbers level over a certain point. Ask your vet. When Rusty's levels come down after treatment, we will give him the shots as soon as the vets tell us it is safe to do so. This discussion will be updated as needed every four months on our web site Up to Date for Patients Additional topics as well as selected discussions written for health care professionals are also available for those who would like more detailed information. Tick Management Handbook This file is 6.62 MB and takes a while to download even with a high speed connection. However, it is comprehensive. Your personal health care provider is the best source of information for questions and concerns related to your medical problem. Every person is different. For Lyme Disease I would go to a doctor who specializes in infectious diseases.